Guest checks are an indispensable restaurant supply item. Waiters and waitresses around the world rely on these little booklets to take restaurant orders and relay them to the kitchen or computer. We are the top supplier of restaurant guest checks in the country. National Checking Carbonless Guest Check Paper Tan 12 Lines - 4.2 in. x 7.75 in. 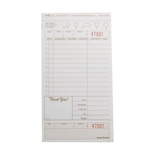 National Checking Carbonless Guest Check Book Tan 12 Lines - 4.2 in. x 7.75 in. National Checking Carbonless Guest Check Green - 4.2 in. x 7.25 in. National Checking Guest Check Shrink Pack Pink - 3.5 in. x 6.75 in. 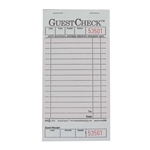 Guest Checks Medium Single Copy Cardboard 18 Lines Salmon - 3.5 in. x 6.75 in. 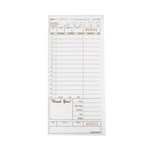 GuestChecks Small Single Copy Paper 13 Lines White - 3.5 in. x 5.13 in. Pink Guest Check Single Copy Paper - 3.33 in.x 6.75 in. Guest Checks are critical for most foodservice establishments. You can buy guest checks at wholesale prices here to keep ordering and service levels accurate and precise in your food establishment. Don't overlook this key item that makes life in any restaurant easier and keeps your service level perfect.